The Aero has been designed to satisfy the “Need for Speed”. The design builds on the best features of previous GreenSpeed trikes, including the SLR race trike which has dominated Australian Pedal Prix racing for the last ten years. Thus the Aero is a road version of the SLR, with more speed features to make it the fastest production trike in the world. At 20 mph, 80% of an ordinary bike rider’s energy goes into pushing the air aside. This is what makes it so much harder to ride into a headwind, than a tailwind. On the Aero you’ll LOVE headwinds! Because when you turn into a headwind on the Aero, you will leave the competition behind, if you haven’t already.Even the cross member on the Aero is streamlined. This is because a streamlined tube has 1/10th the drag of a round tube! The more the seat is reclined, the smaller your frontal area is to the wind and the faster you go. The seat of the Aero is reclined at a low 20 degrees. Wind tunnel testing shows a large gain in speed when using wheel covers. Most bikes and trikes cannot use front wheel covers due to instability in cross winds. The Aero overcomes this and further reduces drag by using 16” front wheels with a 20” rear wheel. To further reduce air drag, the Aero uses the joy stick steering that was first used on the SLR. This is linear action steering, allowing the hands and arms to be closer to the body, moving fore and aft, instead of moving sideways, where your arms catch more wind. The cranks are above the seat, so that the feet are within the frontal area for the body, reducing air drag. Our wind tunnel testing has shown that the exposed callipers on disk brakes produce more drag that drum brakes, where the drum is contained within the wheel. So the Aero uses special 90 mm drum brakes which have been reduced in overall width to fit within the wheel slim wheel covers. Finally, there is a new headrest available if needed. It has a single support strut, in line with the neck, instead of the two struts on previous headrests. While weight has less of an effect on performance than aerodynamics, every aspect of the Aero has been examined for weight reduction. This starts with the frame. The frame of the Aero is non-folding, plus the seat frame is an integral part of the main frame so the weight of hinges and other joints and fasteners are eliminated. Plus the frames are mutually re-enforcing, and thus the whole structure can be lighter and more aerodynamic. We have used 7005 aluminium alloy for the Aero. This has reduced the weight of the frame by over 3 pounds, or 30% over the Cro Mo 4130 prototypes. Although the axle size has been increased from the 12mm of the SLR to 15mm on the Aero to reduce axle flex, the weight of the kingpins has been reduced, as has the front hubs, by totally removing the outer flange. Even the weight of the special GreenSpeed Scorcher tires has been reduced for the Aero. Thus you will notice how quickly the Aero accelerates with the first stroke of the pedals. There is a myth in the cycling world that the larger the wheel, the easier it will roll. This is a carryover from the horse and carriage days, when the larger wheels would sink less into soft ground and a larger steel tired cartwheel would roll easier over a certain size stone. This changed forever with the advent of sealed roads and the pneumatic tire. There is also a myth that thinner tires roll faster. In laboratory testing at GreenSpeed, on many different types and sizes of tires, it was discovered that not only did smaller diameter tires roll easier that large ones of the same construction and pressure, but wider tires rolled easier than narrow ones. Plus certain types of tire construction rolled easier than others. This lead to the design and manufacture of the GreenSpeed Scorcher tires, which have been the number one choice of the top Australian racing teams for the last 10 years. For the Aero we have taken another look at the design of the Scorchers and managed to further improve the rolling resistance by an extra 15%! When you stop pedalling the Aero and coast, you will be surprised at how easily it rolls. On a Penny Farthing bicycle, the larger the front driving wheel, the faster it went. This was because there was no gearing and it was direct drive. The ground covered with each wheel revolution was dependent on the size of the wheel, which was dependent on the length of the rider’s legs. Then the Safety came along with the smaller wheels and gearing, so everything changed. However the myth that larger wheels are faster persists to this day. This myth is perpetuated by the use of gearing designed for bikes with 26” and 700c wheels which is fitted to many trikes with 20” wheels. This results in gearing which is far too low for speed. Thus instead of the standard 50/39/30 cranksets and 11/32 cassettes fitted to many trikes, the Aero has a 56/42/28 crankset and a 9/28 ten speed cassette. This gives a top gear of 20 x 56/9 = 124 inches, V 20 x 50/11 = 91 inches for a standard 20” wheeled trike, or 26 x 50/11 = 118 inches for a standard trike with 26” rear wheel. The Schlumpf Mountain Drive is a popular alternative to the triple, and with the standard 60t ring and the 9/28 cassette, will give a range from 17 to 133 inches. Thus on the Aero you can be sure you will be faster than a trike with a 26” or 700c rear wheel. Plus the Aero will handle better due to less rear end flex. Since the Aero is built for speed, with no compromises, it is intended for use on sealed roads or good, hard packed trails. Accessories include wheel covers, headrest, rear fender and luggage rack. Riders who have previously ridden only recumbent bikes, due to their superior speed, but wished for a more stable machine that they could relax on over long distances, without losing speed, may find their dreams come true with the Aero. Tires: GreenSpeed Slicks, 16” x 1 ½” & 20” x 1.5” – 40-349 & 40-406, 40 to 100 psi. 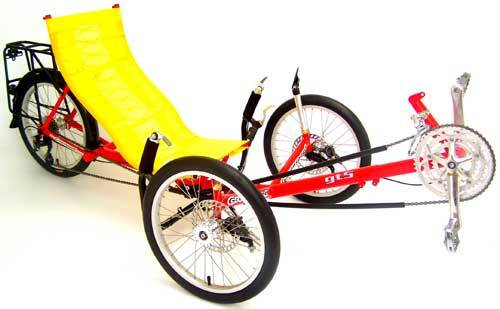 Many people have said that it is not possible to build a trike that is suitable for road as well as off road. Others have said, you must have suspension to give a smooth ride. However, this increases the weight, adds complication, and cost. 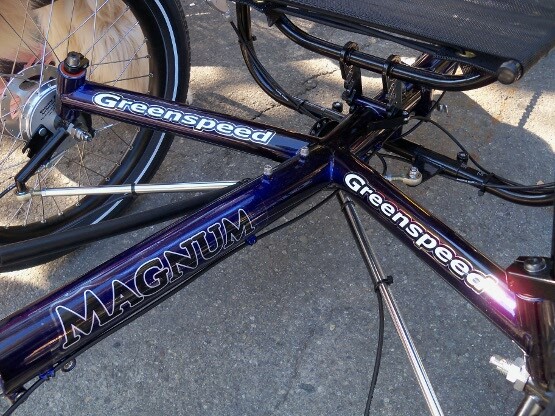 Well, the Greenspeed Magnum breaks the mould in trike design! No longer is it necessary to agonize between the choice of a high seat trike for off road, or a low seat trike for on road, suspension or non-suspension, disc brakes or drum brakes, or a heavy, low performance trike to take your weight. 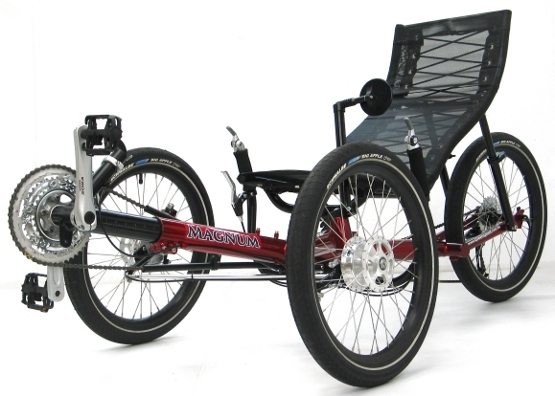 The Magnum is the first recumbent trike to have a seat that is adjustable for height. Plus, it is adjustable for angle as well. The seat height is adjustable from 12” to 17” and both adjustments are with Quick Release levers. Thus, the rider can choose the seat height to suit ease of entry and exit, the riding conditions, and personal preference – low for speed and high for visibility in traffic. Some riders may find they need the seat high at first to help get them on and off the trike. Later, as they become fitter and lose weight, they might find they can lower the seat and take advantage of the lower centre of gravity. This gives better cornering and road holding. Wind tunnel tests show that the lower seat is 2 MPH faster at 25 MPH. While the seat may look simple, it is actually the most comfortable on the market. First of all, the seat cover is completely open weave. This allows cooling to the back, and does not hold water if it rains. Then, the curves were designed by a chiropractor to give proper support to both the lumbar and the shoulders. Secondly, the shock cord lacing provides a good fit to your back, plus it provides suspension for insulation from road shock. Suspension is also provided by the Schwalbe Big Apple balloon tyres, which give both a low rolling resistance and a comfortable ride. The third secret in the Greenspeed ride is the frame. Normally, aluminum frames give a hard ride. However, each tube on the Magnum was carefully selected to give the same good ride characteristics as the CroMo frames. Thus, by just adjusting the tyre pressures, the trike is equally at home on rough roads and smooth roads. Now, for off road use, you need a high ground clearance and low gears, yet for road use you need high gears and good road holding. The Magnum has a massive 5” of ground clearance, yet with the seat low, and the cambered wheels, it has outstanding road holding. Plus, the 9-32 Gold Ace cassette, combined with the 52/42/30 triple crankset, gives a very wide range of gears, from 19” in bottom to 116” in top gear – a range of over 600%! So, you can easily go fast or slow. Disc brakes normally have superior stopping power to drum brakes, but disc brakes make it harder to take the wheels off and on. They are difficult to adjust, the pads wear faster, and they cause more drag. 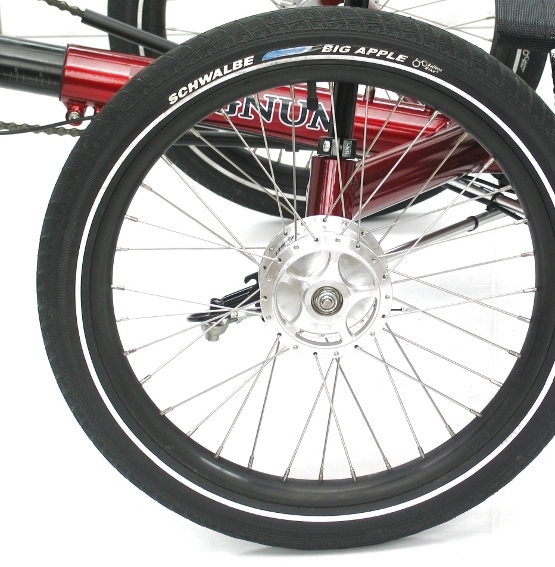 So, the Magnum is the first trike to use the new, larger 90 mm Sturmey Archer (SA) drum brakes. Plus, they are used with the matching SA brake levers, which are longer, and have more leverage. Thus, the performance is as good as the disc brakes without all the disadvantages. Then as a bonus, they come with a press button quick release. So, if you need to make the trike smaller, to place it in your car, taking the wheels off is effortless! Believe it or not, with the central frame hinge, and the quick release wheels, the Magnum will pack down in to the same size box – 28x15x32 inches, as its smaller brother, the Greenspeed GT1. The smaller 16 inch wheeled GT trikes have been limited to a rider weight of 265 pounds, whereas the Magnum, with its larger diameter frame tubes, has a rider weight limit of a whopping 400 pounds! Yet thanks to the high strength 7005 aluminum tubing, the weight of the whole trike is only 2 pounds more than the GT1, at 42 pounds. So, you can be sure that the trike will be strong enough to cope with all your adventures. Some of founder and CEO Ian Sims’ earliest (and now longstanding) thoughts have always revolved around creating products that would give people a viable alternative in personal transport. The many products that Greenspeed have since brought into fruition over the years have been envisioned to not just compete with the car (and fossil fuel) market but also to benefit the health of the planet and people’s individual health. Much of this was happening, of course, long before environmental conservation and sustainability became household bywords and savvy politically strategy. 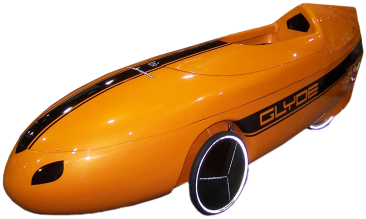 For Greenspeed the GLYDE velomobile is the natural culmination of close to two decades of hard work and dedication to its founder’s early vision. At the same time, this new velomobile takes the company a quantum leap into the future. Welcome to this era! The GT1 is a small trike with a big personality. Designed as an easily transportable trike so that you can fold it up to fit in your car or to take up less space in your shed, it’s quick fold is achieved with only a 6mm Allen key for the single seat bolt and one quick release for the frame hinge. 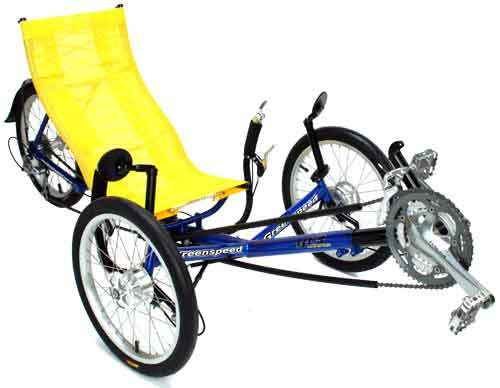 This trike is ideal for weekend riders, commuters or even assisted touring. Made in a small and standard size, you should find one to suit you. There is a weight limit of 265lbs for this trike. The GT3 is a small trike with a big personality. Designed as an easily transportable trike so that you can fold it up to fit in your car or to take up less space in your shed, it’s quick fold is achieved with only a 6mm Allen key for the single seat bolt and one quick release for the frame hinge. The GT5 is a small trike with a big personality. Designed as an easily transportable trike so that you can fold it up to fit in your car or to take up less space in your shed, it’s quick fold is achieved with only a 6mm Allen key for the single seat bolt and one quick release for the frame hinge. 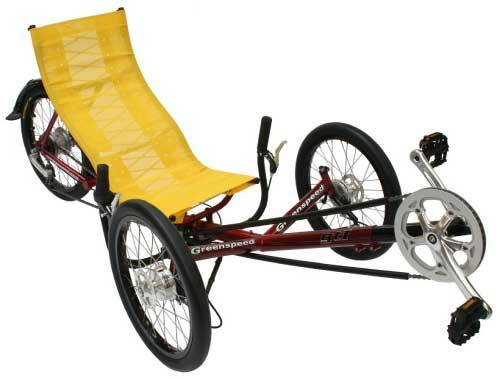 This trike is ideal for weekend riders, commuters or even assisted touring. Made in a small and standard size, you should find one to suit you. There is a weight limit of 265lbs for this trike. 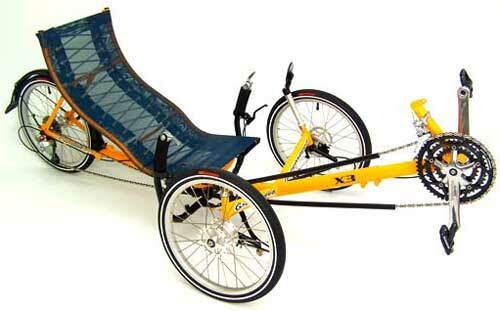 The X3 was created as a sports trike first. Then we added the GT3 folding feature. A low seat base helps to lower the center of gravity for better cornering, front wheels are cambered to increase cornering grip and caster angle has been increased to improve rider feedback. With a reclined seat (30 degrees) and awesome road holding ability, this is the perfect trike for a fast rider with the “need for speed”. Great for commuting, day rides or touring with a trailer. New for 2008 we have added a new wheel package, Velocity Aerohead rims and Schwalbe Stelvio narrow high pressure tires. Greenspeed has more models from which to choose. Please visit their website for additional information.